Bolera Palms School (BPS) is a model primary school located in the Mangochi District on the Southern shores of Lake Malawi. Students attending BPS live in one of the poorest regions in Malawi. 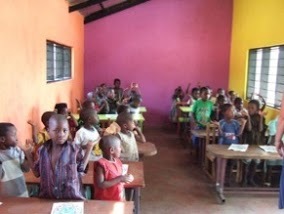 Although there is universal primary education in Malawi, there are particularly low levels of school attendance in the region served by BPS, in part due to the lack of a nearby primary school and in part because of widespread reliance on child labor to supplement meager household incomes. With class sizes averaging 30 students (less than one-third that of other Malawian primary schools), a research-based curriculum that is aligned with that of Malawi, and high-quality teaching, BPS has achieved positive results in the few years it has operated. Students are performing substantially ahead of their grade level; attendance rates are high; and there is strong student engagement in daily educational and recreational activities. The school also provides meals and a range of preventive health services, further supporting the positive development of BPS students. YPI provides in-kind and financial supports to Bolera Palms School. YPI is also working to forge li nks between the school and teacher preparation programs in the United States.